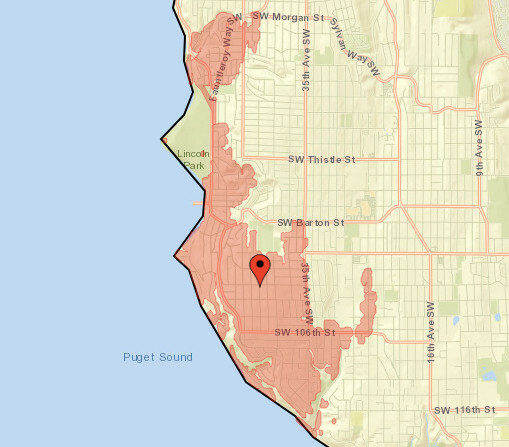 72 Replies to "UPDATE: West Seattle early-morning power outage cuts electricity to 4,700+ customers for hour-plus"
It’s out in the Arroyos too. Out near Kenny Home and Gatewood School. Yes, all of Fauntleroy appears out as well. Lowman Beach is out. First time in 3.5 years of living here and having it go out. Any idea what’s up? I’ve lost power. Home is near Lincoln Park. We are out on SW Wildwood Place bear the ferry dock. Happened about five minutes ago. The power just went out a few minutes ago, right in the middle of my online test…There’s no storm so I wonder what caused it. Arbor Heights here. It seemed to go off at 1am. We’re halfway up the hill from Lincoln Park and can see all the way over to the top of Marine View Drive and it’s all dark except the ferry dock. Vashon Island has the lights on. Hi Ada, I’ve lived in Arbor Heights for over 40 years. We’ve been lucky up here through a lot the windstorms n not had too many outages. Probably just an out dated infrastructure “piece/part” that’s needs to b replaced & just so happened it was tonight. Hopefully it will b back on line b4 our cold weather comes in. Ah ha. That makes total sense. Thanks, Gabe! Yeah! I live in Arbor Heights. This is so weird! No storm. No wind. No rain. Power out in Arbor Heights. Power out on Fauntleroy just north Lincoln Park. Now hearing a loud, odd, and persistent buzzing noise too. Same here! I thought I was going crazy. I live basically on Lincoln Park and heard it. Pretty sure it’s the backup generators kicked on and running at the retirement community The Kenney right on Fauntleroy there I just walked out to figure it out myself. I was hoping it would be linesmen trucks but they have power luckily! Out in arbor heights. Wth??? On Gatewood hill, just above the Thriftway. And we’re out too. Out in Arbor Heights-106th west of 35th. Never lose power here even during crazy winds. Yep, power is out. We had a couple flashes after it went out initially, then nothing. Power is out in parts of Morgan junction as well. Out near Holly Street and California. I happened to be looking out the window and saw a flash coming from higher on Holly Street as the power was going out. Does anybody have a uninterrupted power supply we can use so our fish don’t die? Just moved the milk and meats to the freezer. ….just as the power comes back on. Yay! Powe back on in Arbor Heights! Power is back in Arbor Heights! I have lived here almost 30 years and never seen so many power outages as in 2018/19. glad it was not very long…have bad memories of the 3-4 day outage in Arbor Heights many years ago…not fun. We still have the power all night long. And never knew the power outage until I saw the Komo news saying. Stay warm out there!! Happy Sunday! Odd. We live at the Marnae across from the Shell in Gatewood and had no outage but all our neighbors around us did. Kinda eerie. Woke up at 2:50am to an appliance beeping back on. Smelled a strong electrical burning smell in the house. Anyone else notice anything like that? We live at the north end of Lincoln Park. Huh. I guess we were that one house, because our power was out when I awoke at 3:30. Weird. Although it does make me feel mighty special. We never lose power here on 97th thru all the snow storms thunder heavy rainfall even when the thanksgiving windstorm of 2006 knocked the whole region out this specific half of the block was up and running while everyone around us across the street even two doors down were knocked out but last night we lost power here for the first time ever. Anyone ever hear why it went out from City Light? I didn’t have time to ask yesterday but I did today. Underground cable failure.